Bring out the romance of Route 66 and the adventure of the West with western boots from Cherokee Trading Post & Boot Outlet in Clinton, Oklahoma. There are so many different designs to match various styles that you may find it hard to buy just one pair. Additionally, we sell one-of-a-kind Native American jewelry and striking pottery. 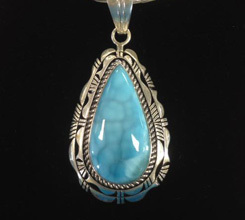 Eugene Belone created a beautiful 3" x 1.25" Larimar pendant in the classic tear-drop style, mounted it on sterling silver, and stamped his name. We offer this gorgeous piece of jewelry for $420. It does not come with a chain. This traditional-style pottery featuring a wolf was crafted and signed by Arnold Joe. It stands 19" tall and is 10" across at the widest point. The price of $299 includes a card from the artist.